All of the these activities and trips are optional. Don’t forget to ask about any that interest you at the time of application. Our school offers weekend and after school activities at extra cost and most of these are offered depending on the season. Contact us to learn more about what can be done, when, and at what cost. For any special need or requirement our staff will be glad to help you or advise in any way they can. 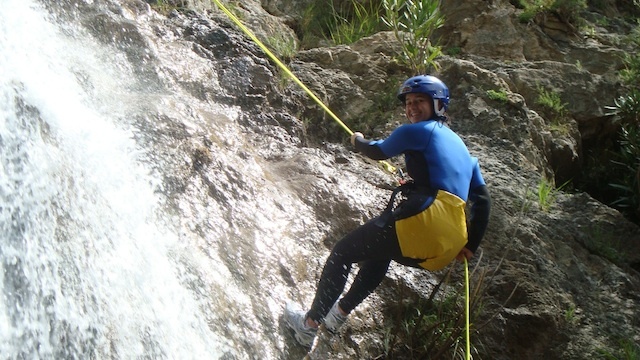 Most of the activities are offered on an introductory level and they can be mixed such as in “Green days” (river descent & canyoning, rock climbing, Rope sliding) or “Blue days” (sailing, kayaking, windsurfing). * Our customers can take scuba diving lessons or have daily-guided boat dives and enjoy one of the most beautiful and well-preserved sections of the Mediterranean coast. La Herradura is proud to be the future home of the first underwater diving park and whether you just want an introduction to diving or you are already experienced, this is an opportunity not to be missed. We dive all year round and enjoy over 320 days of sunshine a year – our clients visit from far & wide, attracted by the consistently excellent and varied marine life. The area is so important that it has now been designated as a National Marine Park to safeguard the underwater world. Certified divers can go boat diving every day – there is always a site to visit whatever the weather! Diving here is an all-year-round activity, because of the exceptional climatic conditions on the Costa Tropical.